With the realigned Russian Soyuz TMA-21 schedule not impacting on STS-134’s launch date, Endeavour is pressing on with her April 19 target, after completing the first week of what will likely be her final pad flow. The week has been marked by the usual Interim Problem Reports (IPRs) and the slight drama of a dropped tool, but it’ll mostly be remembered for the tragic death of one of her loyal engineers. It is often underestimated as to the risks of working with the orbiters – as much as health and safety is a massive part of the Kennedy Space Center (KSC) culture. And while the details are vague – as they should be due to private and investigation purposes – Pad 39A witnessed the tragic death of United Space Alliance (USA) engineer James D. Vanover on March 14. RIP. With management standing down the pad flow as a result, Mr Vanover’s colleagues bravely opted to return to work the next day, picking up from the successfully conducted Auxiliary Power Unit (APU) hotfire and mating of the Rotating Service Structure (RSS), into the operations relating to the Space Shuttle Main Engine (SSME) Flight Readiness Test (FRT). 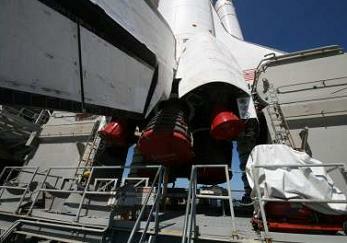 “Launch Pad Validation (S0009) operations resumed. SSME Flight Readiness Test (FRT) and ET actuator cycling are complete,” noted the NASA Test Director (NTD) reports this week (L2). 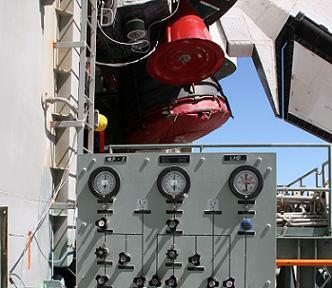 “Hydraulic system closeouts were started with a minor anomaly noted. System 1 compressibility is good. With leak checks and retorque operations all deemed nominal on the Ground Umbilical Carrier Plate (GUCP), preparations for pre-launch propellant servicing were put in work, as engineers mated Quick Disconnects on the Aft OMS (Orbital Manevering System) and RCS (Reaction Control System), after beginning what is known as S0024 operations on Friday morning. Endeavour is only up to 30 IPRs for her entire STS-134 processing flow, the latest of which have all been closed. “IPR 0027 (transducer A87338 indicating 0.8 psia s/b 14.7 psia) update: The pressure transducer was removed, replaced, and successfully retested. IPR will upgrade to GSE (Ground Support Equipment) PR (Problem Report and close,” the NTD listed. “IPR 0028 (Ox coupler MD524 indicating a loss of pre-charge pressure) update: OMS re-performed the interface leak checks with nominal results. Transient contamination is the most likely cause of the failed initial leak check. The IPR will be upgraded to GSE a PR and closed. All other processing operations at the pad have been completed without issue, including the interface test with the Mobile Launch Platform (MLP) and “1st motion system” checkout. Power Reactant Storage and Distributation (PRSD) GO2/GH2 and LO2/LH2 system checkouts, ET camera functional and Firex/Sound Suppression system firing room validations are also complete. Endeavour’s two Solid Rocket Boosters (SRBs) are also in good shape, with lube oil inspections on their Hydraulic Power Units (HPUs) completed, showing servicing was not required. The pad complex is also continuing to receive deliveries of Liquid Oxygen (LOX), with four waves of tankers – 20 in total – arriving on site and replenishing the LOX storage sphere this week. Friday marked a couple of KSC Launch Readiness Reviews (LRRs), with large overviews on the health of the vehicle, and incidents which occurred during Endeavour’s processing flow inside the Vehicle Assembly Building (VAB) and at Pad 39A. The most recent incident occurred this week, when an engineer accidentally dropped an 8 inch wrench from near the top of the pad, causing some minor Thermal Protection System (TPS) damage to Endeavour’s belly. 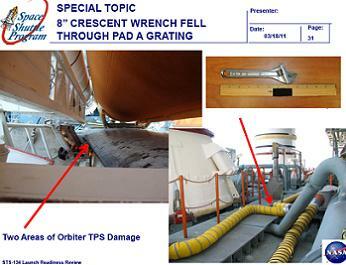 “During FRCS (Forward Reaction Control System) fuel post QD connection operations, a 8” crescent wrench fell between a grating gap in the floor on the 207′ level,” outlined the March 18 LRR presentation (L2). 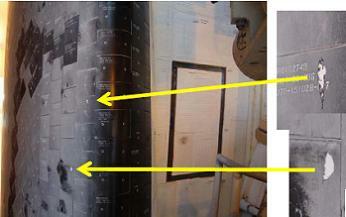 The wrench was found on the MLP below, and the engineer informed Thermal Protection System techs of the likely path the wrench had taken. The resulting damage can be seen on two tiles, and is deemed as minor – unlikely requiring any repair work (an update will be added if this situation changes). “Technician located dropped tool, and informed orbiter TPS personnel of probable fall path. Initial orbiter TPS inspections were performed on 2nd shift. Engineering Walkdowns are in work to verify integrity of flight/ground hardware and/or document discrepancies,” added the presentation. Two previous incidents – which occurred inside the VAB during Endeavour’s mating operations on the same day – were also reviewed in the LRR presentation. 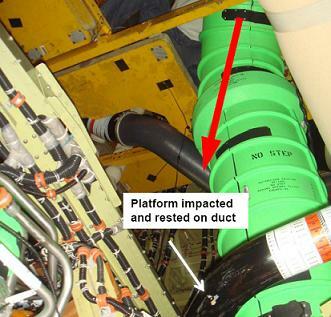 The first incident happened during Orbiter Aft Platforms installation, when an ELSA (Life Support) bottle fell from the entrance level near the 50-2 door. A TQwN (USA Technician ,USA Quality Inspector, and NASA Quality Inspector) inspection of the area was performed to inspect for any damage. 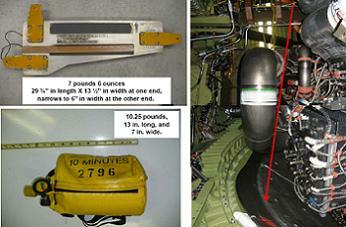 “ELSA Bottle Fell: While manipulating landing gear (GSE) hydraulic hoses to allow for entrance level platform installation, an ELSA bottle previously installed on the orbiter sidewall structure (shelf) became dislodged, possibly due to being inadvertently caught by the hydraulic hoses,” noted the presentation. The second incident – relating to an orbiter aft access platform dropped during installation from the 50-1 door – did require some repair work, which was successfully carried out before Endeavour rolled out of the VAB. “Orbiter Aft Access Platform Fell: While attempting to pin the small platform to two support beams, the platform and/or beams shifted, causing the platform to slip between the beams and fall approximately five feet,” noted the presentation. Several internal actions to prevent a repeat of the incident were noted in the LRR presentation, which also provided notes that several engineering groups have signed off on the affected areas as good for flight. And her launch date remains April 19, following the confirmation from Russian Space Agency Roscosmos that the delay to the launch of their Soyuz TMA-21 was not as long as rumored, with a new launch date of April 4 (22:18 GMT), avoiding any Dual Docked Operations (DDO) constraints – with Endeavour still arriving after the Soyuz is scheduled to dock with the International Space Station (ISS). (Numerous articles will follow. L2 members refer to STS-134 coverage sections for internal coverage, presentations, images and and updates from engineers and managers. Images used: Larry Sullivan MaxQ Entertainment – from a 1200mb database of photos and video (L2) of rollover, VAB and Pad ops for STS-134, and STS-134 LRR documentation on L2).